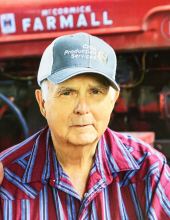 Jim L. Hunt, age 74 of Oakland, IL, passed away Sunday, October 21, 2018 at his home. Jim was born June 6, 1944 to Kenneth and Cleta (Poulter) Hunt. He married Nova Marie Olinger on November 27, 1965, and they enjoyed 52 years together. Jim was a lifelong farmer and especially loved his cattle. He also enjoyed fishing, camping, deer hunting, and had recently taken up golfing. Jim was preceded in death by his parents, and one grandchild: Cole William Tolley. He is survived by his wife; two children: Cindy (Sam) Tolley, and Jim Hunt, both of Oakland, IL; one brother: Bill (Ruth) Hunt of Oakland, IL; two sisters: Linda Hunt of Phoenix, AZ, and Patty (Dave) Postlewait of Ashmore, IL; one grandchild: Morgan (Jaceson) Grant, of Mattoon, IL; and one great-grandchild: Harper “Babydoll” Grant; and twenty-two nieces and nephews. A graveside service will be held Wednesday, October 24, 2018 at 11:00 a.m. at Oakland Cemetery. For those who wish, memorials may be made to the Oakland Senior Center. To send flowers or a remembrance gift to the family of Jim L. Hunt, please visit our Tribute Store. "Email Address" would like to share the life celebration of Jim L. Hunt. Click on the "link" to go to share a favorite memory or leave a condolence message for the family.